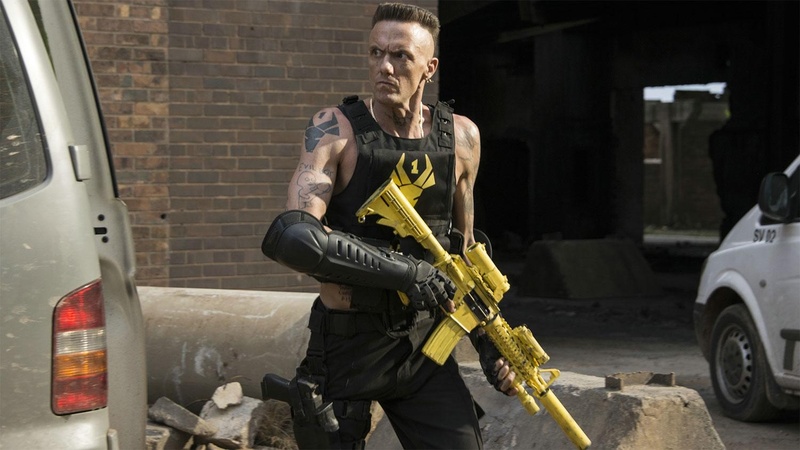 We have another piece of beautifully contrived nonsense from the South African writer and director Neill Blomkamp. 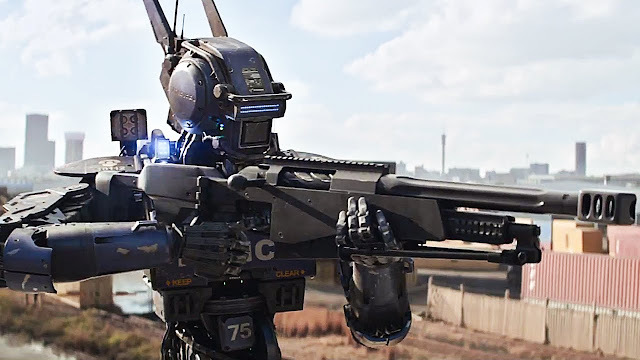 Following the brilliant District 9 (2009) and the hell like vision of the future that was Elysium (2013) comes Chappie (2015). This time we have a western disguised as science fiction based in dystopian Johannesburg in the very near future, like 2016! Its basic story is about an artificially intelligent law enforcement robot that is captured by some badass gangsters who attempt to teach it their version of the facts of life with the implicit intention of it assisting with their criminal endeavours. Deon's heart to heart with Chappie. In a world of slums, violence and economic despair it’s a robot that stands head and shoulders above the have not’s and the corporations that exploit the have not’s for profit. The Tetravaal Corporation provides the city police force with armed robots known as scouts who can carry out basic tasks like killing people but alas cannot think for themselves. But it’s the young nerd type boffin Deon (Dev Patel) who has been secretly developing an AI system that will enable the robots to be programmed to think for them selves in the war against crime and civil unrest. Michelle Bradley (Sigourney Weaver cast by the director because of her iconic role in Aliens) refuses to allow Deon to experiment further, she also tells Vincent Moore (Hugh Jackman who makes a very believable over the top villain) that the Corporation will not finance further investment in his giant robotic war machine unless the civil unrest gets worse – now there’s an invitation! In the meantime Deon rebuilds a damaged robot installing it with Artificial Intelligence. But it falls into the hands of one of the street gangs, which consists of Yo-landi Visser and her boyfriend Ninja (played by the band members of Die Atwood who virtually play them selves but with added violence). 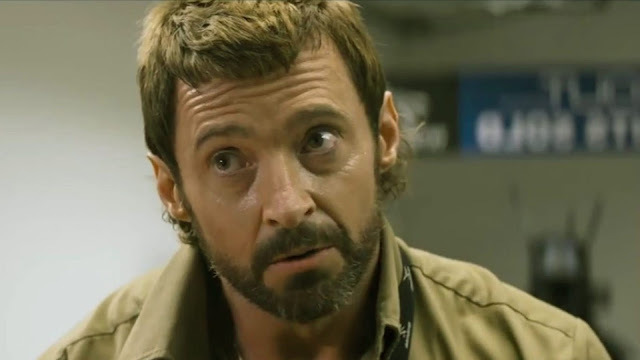 It’s the inner childlike innocence of Yo-landi and Ninja, who become ‘mommy’ and ‘daddy’ to the robot they call Chappie (Blomkamp regular Sharlto Copley) who at the same time as fighting back against a society, that no one in their right mind would want to be part of, is the most entertaining part of a very entertaining movie. Blomkamp and his fellow writer and spouse Terri Tatchell, who was also the co-writer on District 9, asks the viewer to decide what is human? Does a human consist of a recognised body and brain or does the transfer of consciousness to a robot already equipped with AI make that a human? Perhaps I could end this review by quoting Kim Nicolini: ‘don’t underestimate the political economics of this movie. While Blomkamp’s earlier films District 9 and Elysium very clearly showed the divide between those who have power and money and those who don’t, this film brilliantly shows life at the bottom of the pit, how those who are left with scraps survive, and how they ultimately maintain humanity in an inhumane world’. A good summing up I would say. If you enjoyed Neill Blomkamp’s previous outings then I would suggest you make every effort to see this one.